Time of realization: February 24 - 26, 2010. Place of realization: Pavilion 1, Hall 1, Crocus Expo, Moscow, Russia. The organizer: Mir-Expo Exhibition Company, Ltd.
Advance and use of modern marketing tools as catalysts of the Russian composite market, development and introduction of composite technologies and materials in different branches of industry - here are the main purposes set before the organizers of the third international specialized exhibition "Composite - Expo". On February, 26, 2010, having successfully completed its work, "Composite- Expo 2010" clearly demonstrated that it had managed to solve the problems posed by both the organizer of the exhibition, Exhibition Company "Mir - Expo", and the exponents. The main sections of the exhibition were as follows: raw materials for composite materials' production (resins, glass fiber cloth); additives and modifiers; equipment and technologies for composite materials' production; composite materials' treatment tooling, glass-fiber, artificial stone, artificial marble, organic concrete; manufacturing technologies for composite materials with special and defined properties; bonding of composite-based products; surface treatment technologies; composite-based industrial products, composite materials' use in construction and housing and communal services. Within the exhibition there ran the 3rd R&D conference "The Current State and Growth Prospects of Manufacture and Use of Composite Materials in Russia", at which the specialists from Dow Europe GmbH, Jushi Group Co., Airtech Europe Sarl., Mikrosam AD, Owens Corning, CJSC Holding Company "Composite" read their abstracts on the various aspects of the topic. The 2nd International Specialized Exhibition "Polyurethanex" ran concurrently with the "Composite - Expo", thus giving a wide circle of visitors-specialists an opportunity to see with their own eyes the innovation technologies and samples of integrated products of an actively developing branch of industry - production of new materials for different industries. The use of new construction materials is a step up to a higher technological level for both producers and consumers of this innovation production. It promotes the development of this prospective branch of industry in Russia. The general directions of the exhibition reflect the following subjects: Raw Materials for Polyurethane Manufacturing; Polyurethane Producing and Processing Technologies; Foamex based Thermo Insulation; Equipment and Production tooling for Polyurethane materials; Polyurethane Use in different industries. At the same time the International Specialized Exhibition "Innovative Materials and Technologies" run for the first time and included the following sections: Magnets, High-Pure Materials, Technical Ceramics, Functional nanomaterials, Rare Earth Metals. Having a few exhibitors for now, the exhibition, in exhibitors' opinion, has great prospects of developments. Despite of economic recession influence, quantity of the exhibitors is managed to keep on the same level. On the space of 1000 sq. m there situated 56 exhibitors, including 18 foreign companies from the USA, Germany, Turkey, Hungary, Macedonia, China, Ukraine, Byelorussia. Such companies, well-known in the industry, as AirTech Europe Sarl, Nalchiksky Composite Materials Plant Ltd, Altair Ruspol, BauTex, Prepreg-ACM CJSC, Polotsk-Steklovolokno JSC, P-D Tatneft-Alabuga Fiberglass LLC, Safit CJS, Steklonit Management, Stupino Glass Reinforced Plastics Plant LLC, Uglekomposit JSC, Carbon Studio, Mikrosam AD, JSC VATI, AB Universal LLC, Intrey LLC, Composite group, NPK Khimpromengineering JSC, Glasstex Group Corp, Hainan Fuwang Industrial Co., Ltd, Jushi Group Co., Ltd, CPIC, Chemtura, Deinex, Kronos SPb paint and coatings plant, FKP Permsky Gun-powder plant, Momentive Performance Materials Rus LLC, BorsodChem Zrt., Polyurethane Trading house, Companies group PROMUS LLC, Polyru LLC, Faeton LLC, Gsal PU Additives Ltd., Suzhou Xiangyuan Speical Fine Chemical Co. Ltd, Ivanovo State Power Engineering University, Institution of the Russian Academy of Sciences Institute of Chemistry of High-Purity Substances RAS (IChHPS RAS), Udmurt State University, NEVZ-Soyuz JSC took part in the event. According to the exponents' appraisal, the effectiveness of the exhibition surpassed all expectations. Over 1000 specialists in different fields of industry visited the exhibitions. It is evidence of the growing demands of the Russian market to use modern innovation composite and polyurethane and technologies in the spheres of construction and housing and communal services, machine-building, ship-building, aviation-space industry, electronics and many others. The organizing committee got on the whole positive response on the exhibition. The majority of the exponents showed the intention to take part in the 4th International Specialized Exhibition "Composite-Expo", 3rd International Specialized Exhibition "Polyurethanex" & 2nd International Specialized Exhibition "Innovative Materials and Technologies" next year. It's planned to be held in March, 1-3, 2011 in Crocus-Expo, Moscow. 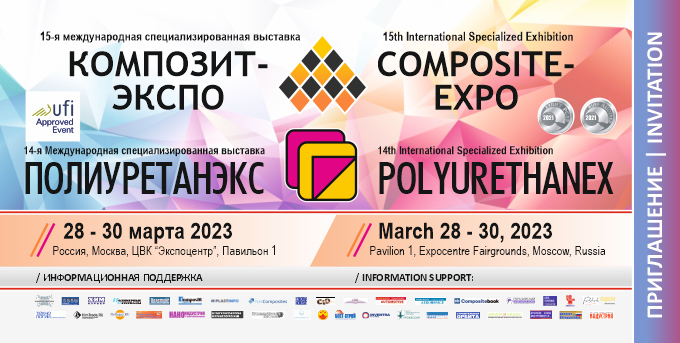 P-D Tatneft'-Alabuga Steklovolokno would like to thank you for the given opportunity to take part in the 3rd International specialized exhibition Composite-Expo. In our opinion the exhibition was fruitful and gave us a chance to establish contacts with our company products' consumers. The exhibition allows to all interested parties (composite materials manufacturers and consumers) to encounter each other on the same ground so that they could conduct negotiations and work out a right business development strategy. I wish you all the best and successes in future! We're pleased with a high level of organization of Composite-Expo 2010 exhibition and we would like to mention distinguished work of exhibition management, their attentive attitude to the exhibitors, apple-pie order and security. We wish to Mir-Expo Exhibition Company, the exhibition organizers, further prosperity, new creative ideas and exhibitors' number increase next year. We thank you the organizing committee for giving a chance to participate in COMPOSITE-EXPO 2010 and for developing the Russian composite market. As far as our company offers some innovation products in composites manufacturing and it was our first participation, there was a special interest to our company. Materials, equipment, technologies we showed at the exhibition provoked a great interest from manufacturers and newcomers who are getting to know with composites world. At the exhibition, we signed some new contracts, met new customers and saw in flesh our partners whom we've been working with for a long time. I think the exhibition is going to be our field-oriented one at which we are going to show our new best practice and developments in composites field. We remained satisfied and we'll participate the next year. Come and visit us at COMPOSITE-EXPO 2011! Next year we're going to have more creative and bigger stand! All things were organized at a good level as always. As an exhibitor of the event we are pleased with visitors of the exhibition. It definitely looks like that the event is visited by professionals and there are almost no "vacuum cleaners" (meaning idlers aiming to collect paper materials as much as they can), like at many other exhibitions. We are definitely going to participate in next Composite-Expo.